My story about storm drains being used as trash cans was featured on Cool People Care today. 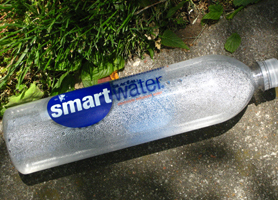 Smart water drinkers are litterers, not “nerd, dork, geek, brainiac, know-it-all, smarty-pants, smart alek, bookworm, egghead, four-eyes, Einstein or being mistaken for the I.T. guy”. You need to update your website. 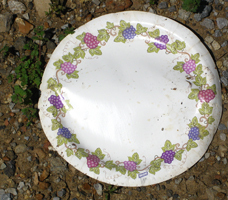 I took this photo of a paper plate between the sidewalk and Acklen Park Drive off West End Avenue. There was a dumpster close by, so I’m assuming that it either blew out of the dumpster or someone missed the dumpster when they tossed it. Or maybe some slob just dropped it on the ground and left it. It wasn’t used unless they ate cookies on it. 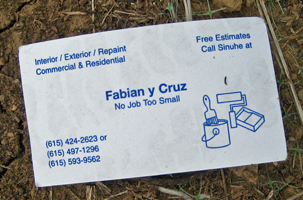 It’s cruel to drop someone’s business card on a public street. 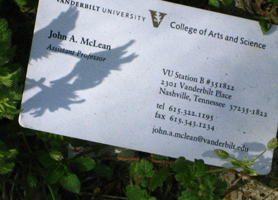 I don’t think Professor McLean intentionally threw his business card on the ground. A student probably “misplaced” it on the sidewalk. Anyway, the card was part of the trash I saw this week during a midday stroll. Only if you’re selling a service, is it a good idea to litter your cards everywhere. But don’t expect me to call a litterer.